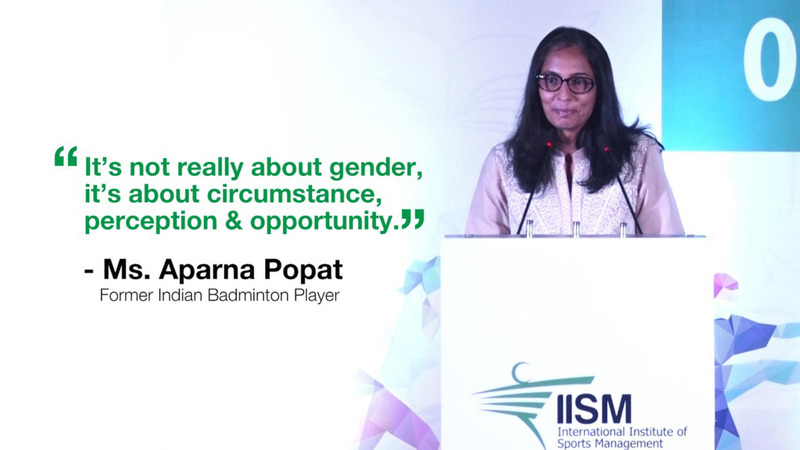 “Women, no longer long to be in sports, they have arrived, they are not here to take space of men rather they are here to share the space.”- quips Ms.Aparna Popat (Former Indian Badminton Player) Aparna Popat,a national champion who holds a record of equaling nine times by winning at all the senior national championships between 1997 and 2006, has often been asked to talk about “Women In Sports”, so much so that she penned her thoughts of why it’s not supposed to be hyped about but rather be normalised. She’s beautifully points out how 2016 Olympic was hailed as women’s Olympic because there were two women who bought us medals at home however the 2008 Olympics that was backedwith our male athletes wasn’t known as the “men’s olympics”. The female tag is used as an introduction, an identifier for all the female athletes, but when it comes to males, this very tag is absent. Serena Williams in an open letter to a magazine, once said– “My dream was to be the best tennis player in world not the best female tennis player.”Do we, as women, need the tag? Are we by playing sports or being involved in sportsdoing something extra ordinary and unnatural? Does sports potentially goes against a women’s feminine stature?Well, women are stereotyped, they’re expected to be short and slender, small and delicate, shy and passive. They’re not supposed to be acquainted with the sports world, they’re not ready to be a part of the tough sporting ecosystem. Are they? Well if that holds truth, then what would you say to champions like Saniya Mirza, Hima Das, P.T. Usha, Saina nehwal and so many others who’ve time & again proved to the world that WOMEN IN SPORTS MATTER & SPORTS MATTER TO THEM. Why just the athletes, take a note of all the female support crews, the women in sports media industry who are not just enthusiastic about sports but have done phenomenal jobs.Whether it’s anchoring, administration, coaching, physiotherapy, or any avenue in sports, the women of today are in for it. “It’s not really about the gender. It’s about circumstance, perception & opportunities.” Watch Ms.Aparna Popat read out this extremely thought provoking open letter, click here.